There is an increasingly obvious pattern explaining how the Internet works at scale, and it seems like it could shed light on how future Internet activity will unfold. A new media model on the Internet enables exciting new ways for people to share information and to communicate. As the volume of activity increases the experience becomes more complex. 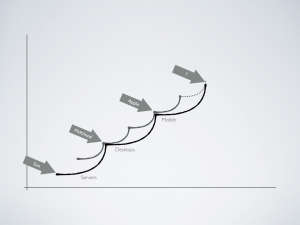 The complexity growth curve eventually forces a change - it starts increasing at a faster rate than the growth of the activity itself. A breaking point occurs. Participating becomes something people have to do in order to be part of the network, not something they want to do. As a result, a new type of activity appears in response, something that solves the complexity problem and enables exciting new ways of connecting. 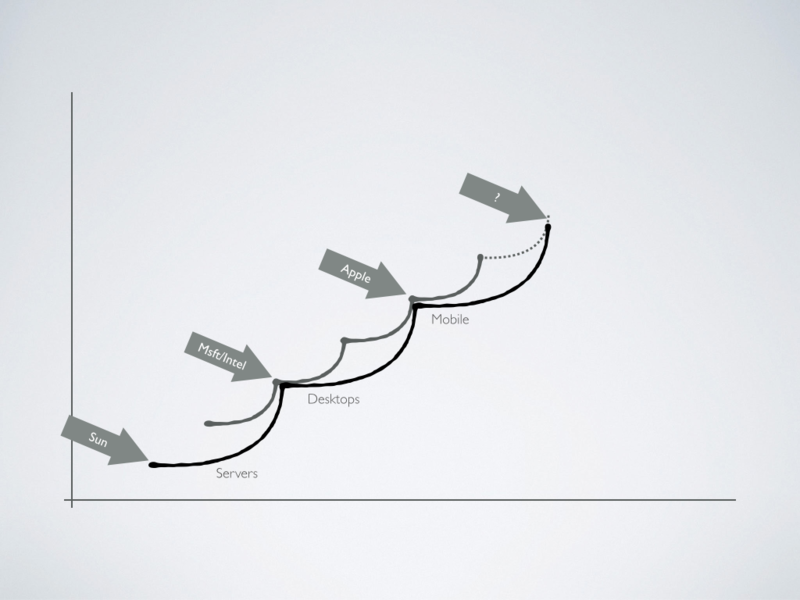 The cycle appears to happen via two distinct but parallel waves – information sharing and new ways of communicating evolve across a 5-year wave, while new hardware, operating systems and dominant network protocols evolve on a slower 10-year wave. Ultimately, there are three run away champions. One that dominates the space via advertising, one that dominates through transactions, and one that owns the key hardware and operating system that people use to participate. They all achieve this position by establishing business models that benefit from the current pattern, optimized to leverage the characteristics of the new activity. Five years ago when I was looking at this stuff the pattern indicated that by this year, 2015, social activity was going to become overwhelming and a breakthrough would appear in response to it. WhatsApp, Snapchat etc are a direct response to the overwhelming amount of activity happening on the big social platforms. Private messaging solves today’s complexity problem. Private ad exchanges, members-only programs, privileged access services, private transactions and cybercurrencies will all flourish in this environment. Inequality will become a commercial virtue. However, a large-scale network that values privilege is going to create serious long term problems if we fail to at least acknowledge the implications of it. Inequality breeds resentment and power struggles. The Internet’s amazing democratic capabilities will become even more politicized. Divergent agendas will wage legal, economic and cultural battles with increasing sophistication and with more at stake. But perhaps we can keep an eye on what to expect further down the line in order to maintain perspective on these short term shifts. What comes after the current wave? What happens in 2020? If the pattern continues then the volume of this new activity will become overwhelming which will trigger a response. We’ll hit a ceiling when the amount of exclusive activity becomes unmanageable. A great outcome would be a reinvestment in the open Internet, but, if history serves us, then the incumbents will be deeply established and too strong to overcome. A total rejection of the network is more likely than a return to its roots. A less dramatic outcome would be about alternative protocols on alternative networks. Technologies enabling Internet-of-Things are obvious candidates for the new hardware wave. If that’s happening then it’s easy to imagine physical gestures becoming the dominant way we experience the network. Who benefits? How will people make money? These are big question for another time. Can we zoom out on this model? Is there a meta pattern in the pattern? Maybe there’s a 20-year wave where complexity across all network activity increases to unbearable levels. If that is actually what happens then it’s reasonable to expect a transportation revolution. When remote communication becomes overwhelmingly complex then we will want better ways to get places and to be with people. This might be forced on us all by external events such as climate change, so it seems likely to happen at some point, anyhow. Maybe this pattern offers some clarity on what circumstances will get us there and when. You can’t take any of this too seriously, obviously. The pattern lacks rigor. There’s no data behind it. It doesn’t take into account external events that shape rates of change. And the time frame we’re looking at is too small to draw meaningful conclusions. It’s merely a working hypothesis. However, if Bill Gross is right about the importance of timing then maybe this pattern is worth applying to whatever you are working on. If privilege is what matters then you need to have a position on it. Are you building trust as a core activity of your work? Do you make your customers feel privileged? 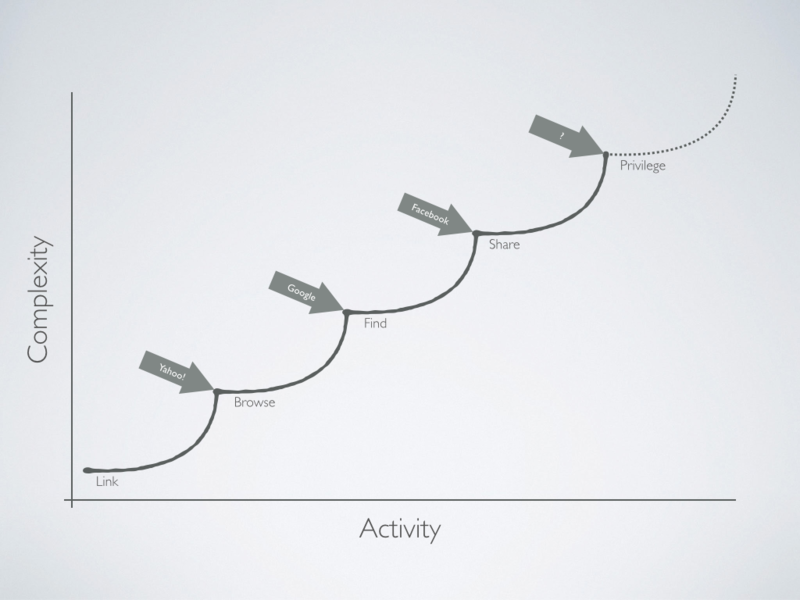 Does activity increase in value to your customers the more exclusive it becomes? You don’t have to do those things as a pureplay like messaging apps or dating services or private trading networks to be relevant. But you can be sure that those issues will matter more and more over the next 3 to 5 years. Equally, who is keeping privilege in check? Who becomes more powerful in a privileged world, and who is ensuring they are using that power fairly? Who is going to worry about all this on behalf of the rest of us who get caught up in it? The nuances of privacy in this new world are going to make it harder than ever to keep power in check and to challenge authority. We’re going to need clever journalism now more than ever before. What does it take to get on the wave? If you’re reading blog posts like this about current trends then you’ve probably missed the leading edge of the current wave already. Rather than ride this one you may get thrown by it, and going against it may get really difficult. You might be forced to shift your agenda in ways that contradict your latest 5-year plan. It’s certainly not too late to try to get on it. Being open to partnering with people who are closer to the leading edge than you are can be a good way to navigate unfavorable conditions even if they challenge the very core of why you exist. An external mirror is very useful when facing existential crises. Also, I don’t know if “the enemy of my enemy is my friend” works in a world built on coopetition. But it’s a good idea to know who Facebook worries about. The good news is that you can be sure that there will be another chance to get your timing right. When there’s too much privileged, private and exclusive activity the network will become too complex again. And everything will change because of it. That’s one thing we can all count on. Get up early, paddle out to the waves you want to catch, and try a few to warm up. Stand up when the right one comes along and ride it for all it’s worth. This was a question posed at a journalism event recently. I was really surprised to hear it. I wasn’t sure whether to list the many technologies and examples of places where it has been tried and failed over the last 15+ years at news orgs large and small or to respond to the business model implied by the question. It’s easy to understand why people still believe sustainable journalism can be achieved through traditional commercial trade like this – reader gives publisher money, publisher gives reader articles. It sounds very sensible because it used to work just fine this way. New thinking will eventually clear out the old thinking, but in many cases we also need to unlearn what we think we understand. There’s a great example of this by SmarterEveryDay who demonstrated a brilliant experiment in cognitive dissonance. He unlearned how to ride a bike (h/t @albertwenger). It turns out that the reason riding a bike feels easy once we’ve learned is because our brains ruthlessly protect our understanding of how to do it. We tend to lock down hard-earned knowledge and keep it that way, though children’s brains are very willing to adjust to changes in conditions. Paywalls, micropayments, paid news apps, etc. are all industrial production-style business models translated for the Internet. They make sense given what we thought we knew, and, as a result, a lot of people are certain they will work. Just like TV is much more than radio with pictures and how a web site is much more than a magazine on a computer, the business models enabling sustainable journalism can’t be translated from the technological predecessor. A generation of entrepreneurs is going to wipe away those ideas and reinvent network-native business models for sustainable journalism that have a lot less friction and benefit many more constituents. What models for sustainable journalism operate beyond the limits of the medium through which the journalism materializes? It’s probably the wrong question, come to think of it. I’ve got my own biases that need to be recalibrated, too. Regardless, a change in thinking is required in the hivemind that believes the answer is a digital version of past successes, and I suspect it’s going to be much harder than learning how to ride a backwards bike.